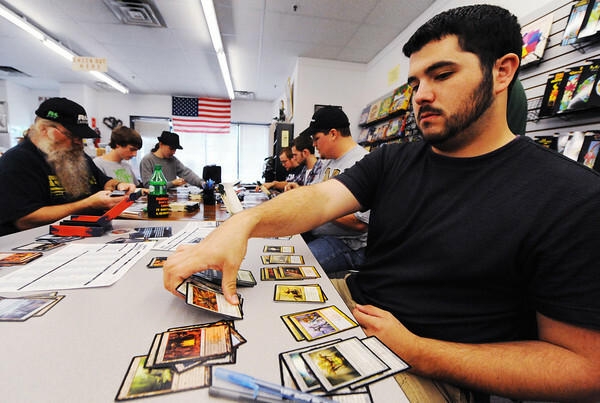 Player Clayton Palmer, right, of Joplin, builds his card deck during the start of a pre-release "Return to Ravnica" tournament for the collectible card game "Magic: The Gathering" Saturday afternoon, Sept. 29, 2012, at Changing Hands Book Shoppe in Joplin. The store had about 35 players in attendance for each of its Saturday tournaments (about 70 total). Pre-release events were also held over the weekend at Hurley's Heroes Comics & Games on Main Street and Vintage Stock at Northpark Mall in Joplin. Changing Hands' third pre-release tournament will be held at noon Sunday and Hurley's Heroes will host another at 4 p.m. Sunday.